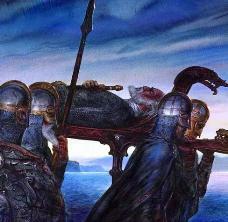 Beorhtnoth was wrong, and he died for his folly. But it was a noble error, or the error of a noble. It was not for his heorowerod to blame him; probably many would not have felt him blameworthy, being themselves noble and chivalrous. But poets, as such, are above chivalry, or even heroism; and if they give any depth to their treatment of such themes, then even in spite of themselves, these "moods" and the objects to which they are directed will be questioned. The Homecoming of Beorhtnoth, Behornthelm's Son originally appears in Essays and Studies for 1953; and was intended to be a recitation. This came through clearly; indeed, I found myself wanting to read it aloud. The poem is a very readable account of two of Beorhtnoth's servants as they search the battlefield of Maldon, (the battle occurred in August 991) for their lord's remains to bring him back to the monks he protected for proper rites and burial. The two are opposites - the older, Tidwald, had seen enough of fighting in his day. While they are searching for their lord's body, he tries to persuade Torhthelm, a young minstrel's son, that the lays and songs of the old heroes such as Hengst and Beowulf don't really tell the whole tale. The point that battle makes bodies and not just heroes, is clearly made when they must search through the corpses of many men known to them both before they find their lord's headless remains. From that point, they struggle to carry the mutilated body back to their wagon. In Beowulf we have only a legend of "excess" in a chief. The case of Beorhtnoth is still more pointed even as a story; but it is also drawn from real life by a contemporary author. Here we have Hygelac behaving like young Beowulf: making a "sporting fight" on level terms; but at other people's expense. In his situation he is not subordinate, but the authority to be obeyed on the spot; and he was responsible for all the men under him, not to throw away their lives except with one object, the defense of the realm from an implacable foe. He says himself that it is his purpose to defend to realm of Æthelred, the people, and the land (52-3). It was heroic for him and his men to fight, to annihilation if necessary, in the attempt to destroy or hold off the invaders. It was wholly unfitting that he should treat a desperate battle with this sole real object as a sporting match, to the ruin of his purpose and duty. ♦ Following the poem is a commentary on chivalry and heroics, loyalty and personal pride. Tolkien makes the case quite eloquently that what both Beowulf and Beorhtnoth did was wrong and why it was wrong. ♦ Suggested reading: The Battle of Maldon and Beowulf.